Our range of products include aloevera massage gel, mix fruit massage gel, glamour orange-papaya gel, glamour green apple gel, cucumber massage gel and glamour neem-tea tree gel. Packing Size 100 g, 200 g, 500 g, 1 kg. Packing Size 100 g,200 g,500 g,1 kg. Glamour Orange-Papaya Gel: This massage gel enriched with orange and papaya extract is used for excellent cleaning of oily skin. Natural Vitamin 'C' From orange extract gives relief from bruises, pimples, etc, whereas enzymeenriched papaya gives rejuvenating effect. 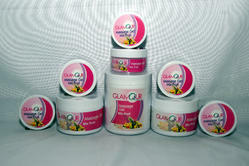 Glamour green Apple Gel:This massage Gel enriched with green apple extract is effective on all skin types. Gives excellent Moisturizing effect to the dry skin. 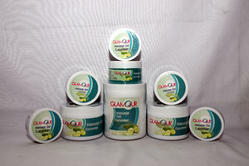 Cucumber Massage Gel is offered to our valued customers, under our array of herbal skin-care products. This type of massage gel is prepared using cucumber extract, which treats the skin spots and blemishes. Being a natural source of vitamin B1 and C, these gels are highly effective against skin eruptions, pimples and blackheads. Our customers can purchase these products in sealed packaging at reasonable rates. 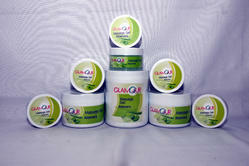 Glamour Neem-Tea Tree Gel: This gel enriched with neem ad tea tree extract is most suitable for rough and damaged skin. Provides extra care to such skin along with antiseptic protection. Used for gentle massaging of acne prone skin.